How do you direct a dog from a distance, when you can't use voice commands? With a swanky science harness, of course. Dogs are used by both law enforcement and military personnel for a multitude of functions, but their uses are sometimes limited because there hasn't been a reliable way to remotely guide them in high-risk situations. Now, a team of scientists at Auburn University has revealed that it has created a remote control system that allows them to guide dogs without any invasive technology. The technology is actually built into a custom harness that is worn by a dog. Within this harness, there is a GPS unit, sensors, and a radio system that's controlled wirelessly from a computer. Vibrations on the left and right side of the harness, as well as different audio tones, are used to guide the dog. 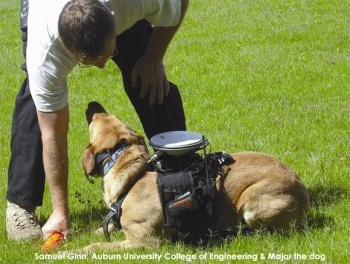 The team at Auburn University has been testing the harness with a Labrador named Major "and he seems to be doing well when directed to set points that are hundreds of meters apart." Using a Labrador makes a lot of sense, since they're easy to train and are often used as Guide Dogs. According to one of the scientists involved with the project, there's a lot of potential uses for this technology. Potential situations include using dogs to investigate potential drug dens more stealthily than a person could or delivering emergency supplies to people in a risky environment.